Why I am I doing a second take on the Background Check challenge? Because I am a dumb a$$ that's why! I failed to read the guidelines for the challenge which clearly state to use a background stamp or stamp your own background...keyword there being STAMP. Nope, I didn't stamp the background on the first card, I used stencils and ink, exactly what we were told NOT to do (that's where the dumb a$$ comes in). So, here is my revised take on the challenge and I PROMISE that I stamped this time. I used the print pattern background stamp and STAMPED IT with versamark then heat embossed it with clear embossing powder. Then I used my alcohol ink applicator and felt pads with three different distress inks over top of the embossed background. Everything on the card is from my stash with the exception of the brand spankin' new #hastags stamp set from Tim Holtz which I am totally and absolutely in love with! Be sure to visit the SHOPPING OUR STASH BLOG for all the details on the challenge...and be sure to read the instructions and STAMP your background...while you are there visit the blogs of my teammies and show them some crafty love!! Bwahahahahahahahahahhahahahahah! *ahem* I love this one, too! tee hee And you em-PHAS-is on the STAMPing. I'm also HAPPY you left the other post up since I LOVE that card, too! lol - well, I for one am glad you mucked up the first one because I really love this one too! 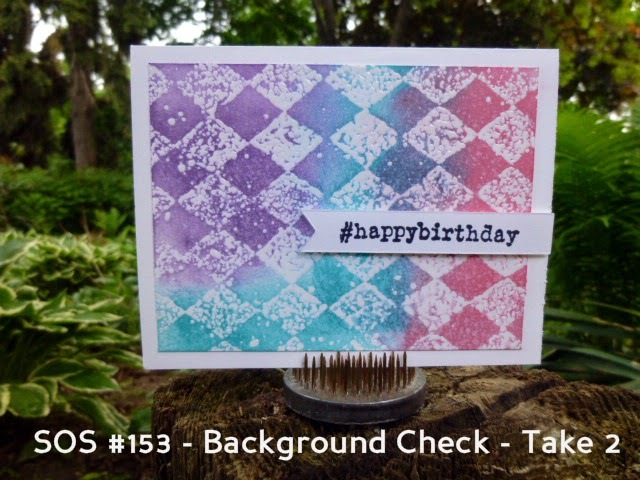 Such fun you've been having with inks!Fabulous STAMPED and inked and embossed background! Awesome card, so different from your first take. I can't tell you how many times I have finished a DT card and then looked to see the "twist" or "stash" item and fount out I forgot it. Sometiems it's easier to make a new one that fix the old. You would think "one" would look BEFORE you make the card. lol. This card is fabulous also!! Where have I seen this technique before? Oh, on MY failed first attempt! Buahahahaha!! This is absolutely gorgeous!